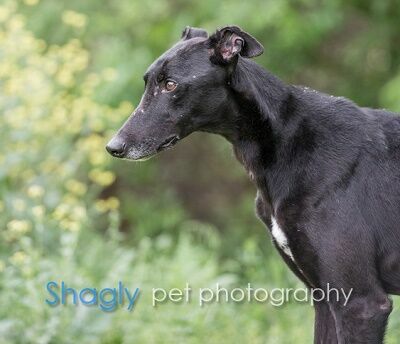 Layne is a 3 year old black male found along with Erin and Garrett in Tulia, located in west Texas. Layne's registration tattoo is illegible, but he is 74B, making him born in July 2014. Layne arrived very thin and had a positive titer to Ehrlichia Canis. He has successfully completed his treatment and has a negative PCR (polymerase chain reaction) test. This boy is ready to find his forever home. Layne should not live with small animals or cats at this time. Hi I’m Layne, a 3 year old male with an awesome black coat. I look so much better now that I’m healthy! I’m pretty greyt, and the most important thing you should know about me is that I love playing with toys. My foster mom says I’m very playful and that I love every kind of toy I can get my mouth on! I get along with my greyhound foster siblings and think I would do best in a home with other big dogs in my pack (no kitties please). I like to go on walks and would really like a family that likes walks too, or at least has a big back yard for me to run around. I’m a greyt sleeper and I have perfect potty habits; I can use the doggy door with ease. I sleep through the night in my own bed, no need to worry about me trying to climb on the furniture or trying to get in your bed. I am quite content snoozing away in my own spot. Like any dog, I like treats but I respond best with love and attention. That being said, I have a lot of love to give, who’s ready for some cuddles? The special medical treatment cost needed by Layne is why the Miss Mesa Fund was established. If you would like to help with Layne's care, please take a moment to make a donation to the fund. 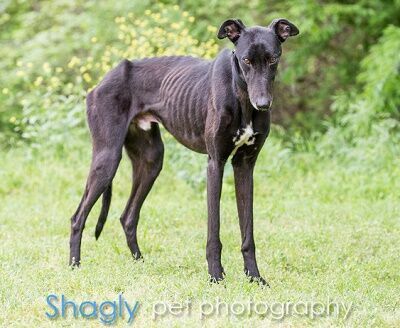 You WILL and CAN make a difference in Ghost's life and the lives of other greyhounds in need of special medical care. Your help and support will make a difference - one greyhound at a time. Please note Miss Mesa Fund/Layne on your check.